Gentle Scale Modelling: There is no stopping me now! There is no stopping me now! Having finished the Ghostbuster's car, I thought I ought to get on with another model so that I would have something to take to Clacton next month. Being a bit of a masochist, I chose the most difficult model I have - well, actually, I didn't! 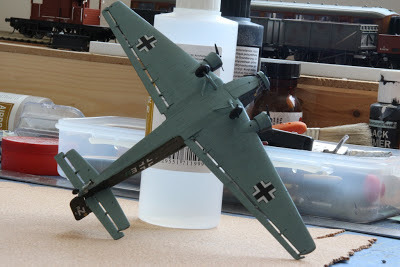 There is nothing difficult about 1/144th scale aircraft. My "brave" choice was an Eduard 1/144th Junkers Ju-52 - 'Tante Ju' as it was known to the German soldier on the ground. This is a small kit but extremely well moulded. 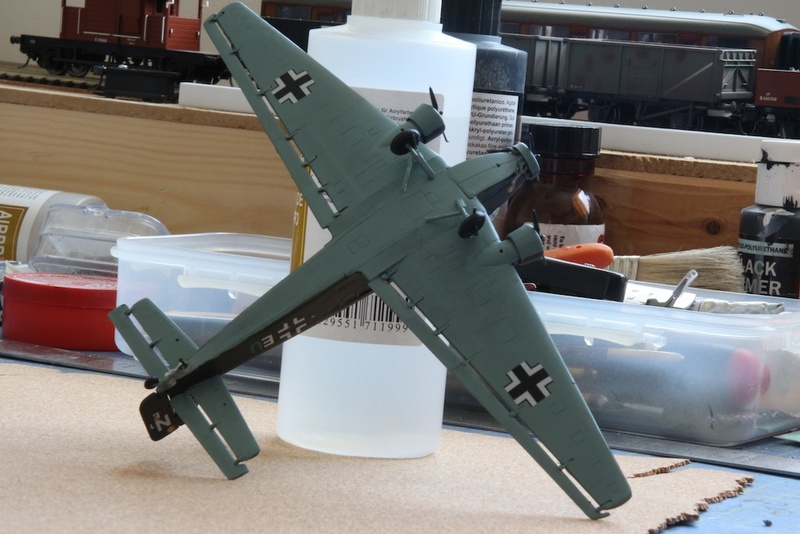 It went together very easily with just a bit of filler on the wing roots. The one big problem I had was that the undercarriage kept collapsing. I sorted this out by putting some brass rods alongside each wheel set so that the aircraft sat on the rod and not on the wheel. Once painted, these really do not show. 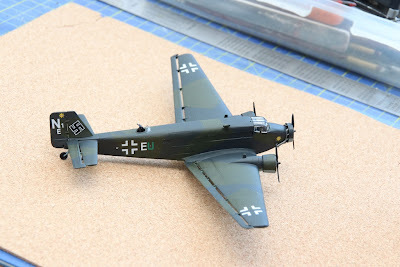 I must admit that I chose the simplest camo pattern as I have rarely done German WWII aircraft so need a bit of practice. Still, I think this looks OK.
What next? I am dithering between the Eduard European Theatre P38 Lightning and the Eduard European F-16. These are both in 1/48th scale and both are rather special kits. 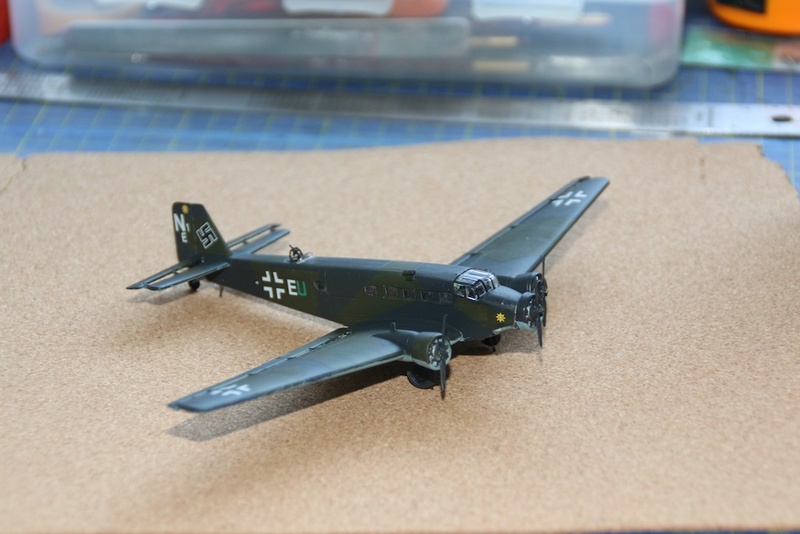 They both are kits made by others (P-38 is an Academy kit for instance) but contain lots of extras such as etched brass, Brassin resin additions, replacement cockpits and highly colourful decals. I am very tempted towards the F-16 in Danish colours - purely because it "doesn't" have a resin cockpit. It does have tons of etched brass though :-(. I feel that I should really finish off the resin COD Fairey Gannet that has been sitting around needing its wing folds finished for at least 18 months, if not more! I will keep the blog up to date so you know where I am going.